The KGS Server Stats window is present only for the curious, there is never a time when you will have to check this window. The "Max" column is the maximum value of the parameter since the server started and not a limit. The "Current" column is the current value of the parameter. For example, at the time of the screen shot, there were 248 users connected to KGS. 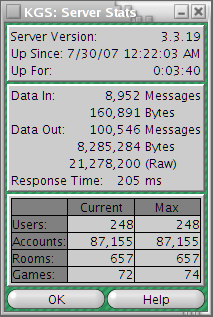 248 is also the maximum number of users that have been connected at the same time since the server was last booted up.